Periodically, we feel it’s worth taking the time to define some of the terms we throw around with which some readers may not be familiar. This week, we examine some of the terminology of automotive design. Axle: This is a term that has several related but distinct meanings. An axle is any set of two or more of a vehicle’s wheels that rotate around a common axis; the beam or assembly connecting those wheels is also called an axle. Of course, many modern vehicles have independent suspension, with no direct physical connection between the wheels. In such vehicles, the term axle is still applied in a more abstract sense to mean the imaginary line between the centers of the left and right wheels. Wheelbase: The horizontal distance between the respective wheel centers of the front and rear axles. On passenger cars, that distance is usually — but not always — the same from right to left. The wheelbase quoted in a car’s specifications is measured with the car stationary and unladen; depending on the suspension geometry, the actual wheelbase may change as each wheel moves through its range of travel. A car’s wheelbase is a critical dimension in many respects, affecting ride quality, maneuverability, and passenger space. In general, a longer wheelbase benefits ride quality (because it lowers the frequency of ride motions) and passenger room (by allowing more legroom), but reduces maneuverability by spreading the car’s mass over a longer distance, thus raising its polar moment of inertia. Conversely, a short wheelbase provides better maneuverability at the cost of a choppier ride and less useful interior room. Overhang: Front overhang is the distance between the front axle and the front end of the car; rear overhang is the distance between the rear axle and the rear end of the car. Overall length: The distance from the front of the vehicle to the rear, including bumpers. A vehicle’s overall length is equal to the sum of the wheelbase, the front overhang, and the rear overhang. 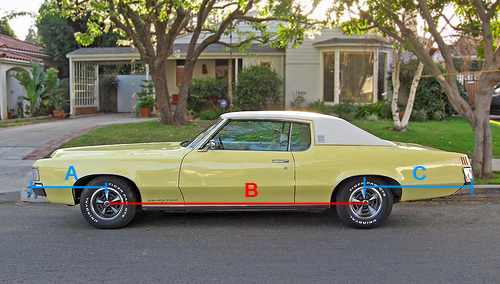 In the illustration above, A is the front overhang; B is the wheelbase; and C is the rear overhang. Naturally, overall length = A + B + C.
Track or Tread Width: A vehicle’s tread width (or track) is the distance between the horizontal centers of the left and right wheels on each axle. The track widths of the front and rear axles are often slightly different, so a car’s specifications will usually list front and rear track separately. (The terms “track” and “tread width” are often used interchangeably, but “track” has become more common to avoid confusion with the width of each tire.) As with the wheelbase, the track widths shown in a car’s specifications are static measurements; depending on the suspension layout, track may change as the car’s wheels move through their suspension travel. Couple: Couple can mean a variety of different things in automotive engineering, but to designers, couple distance is the distance between the driver’s hip joint when seated (which designers call the “H-point”) and the rear axle line. A close-coupled car is one in which this distance is very short. The modern BMW Z4 roadster, which has the cabin pushed so far back that the driver is practically sitting on the rear axle, is a close-coupled design. Next, let’s define a couple of terms the describe how components are positioned inside the vehicle.Transverse or Longitudinal: Naturally enough, transverse means sideways, while longitudinal means lengthwise. In a car, if the component is parallel to the axles when seen in plan view (that is, when viewed from overhead), it is transverse. If it is perpendicular to the axles, it is longitudinal. With automotive engines, a transverse engine is mounted so that its crankshaft is parallel to the axles while a longitudinal engine (also called a north-south engine) is mounted so that its crankshaft is perpendicular to the axle. Leading or Trailing: The edge of a component nearest the front of the vehicle is called the leading edge; the edge furthest from the front of the vehicle is the trailing edge. This can be a little confusing when applied to suspension components because they’re described in terms of their relationship to the body rather than the wheel. A suspension link that connects to the wheel behind the point where it connects to the body is called a trailing link (or trailing arm). A suspension arm that connects to the wheel ahead of the point where it connects to the body is called a leading link. Next, let’s look at some terms related to the body. Body panels: The outer skin of most cars is usually separate from the inner body structure and consists of panels of metal or plastic bolted, welded, or glued to the inner structure. (It’s worth noting here that while each exterior panel may appear to be a single piece, it is typically an amalgamation of several smaller pieces that are welded or otherwise bonded together.) Since the body panels of most modern cars are sheet steel, a car’s skin is often generically called sheet metal, although some cars use plastic or carbon fiber for certain exterior panels, either to save weight or better resist parking lot dings. 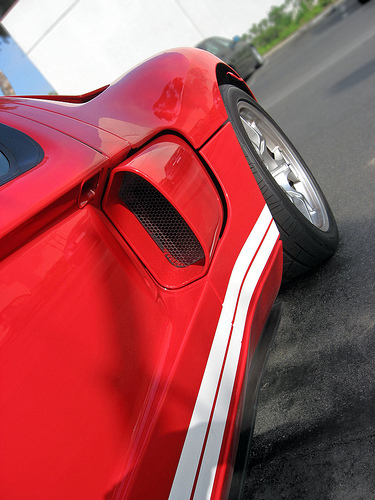 The spaces between body panels are called panel gaps or shutlines. Continental kit: A spare wheel mounted externally on a car’s deck or rear bumper, often with a cover painted the color of the body and embellished with chrome. Buick did not offer a Continental kit as a factory option in the fifties, but various dealers and aftermarket companies offered accessory kits to add one. In the twenties and thirties, some designers — and some buyers — were keen on side mounts: spare wheels mounted in the front fenders, behind the front wheels. Like the later Continental kits, side mount spares frequently had body-colored covers for a more streamlined look. By the late thirties, they were considered increasingly archaic and they fell out of favor just before World War II. This 1936 Cadillac V-12 convertible shows off its neatly trimmed and decorated side mount spare wheel. Like many side mounts of this era, the mirror is clipped to the top of the wheel’s cover. A major drawback of side mounts was that moisture would pool in the well under the wheel, promoting corrosion. Wheel well or wheelhouse: The area in each corner of the car’s body that contains the wheel — and the clearance needed for it to turn and move up and down through its suspension travel. Fender: The exterior body panel surrounding each wheel well. (Our British readers call this a wing; American designers sometimes refer to the rear fenders as quarter panels.) The original purpose of fenders was to keep the wheels from throwing mud, water, or dirt onto the windshield and interior. 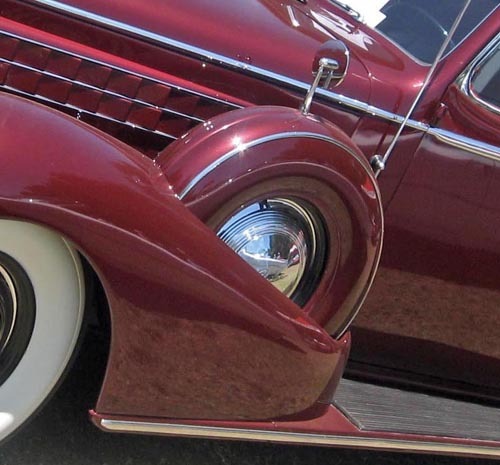 A fender skirt is a trim panel that covers part of the wheel opening. 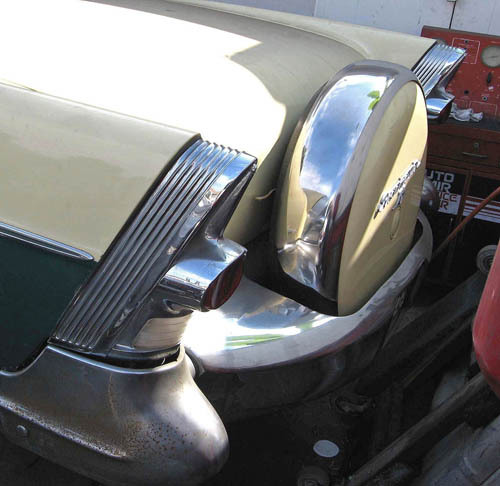 Many fender skirts are removable to facilitate tire changes or other maintenance. 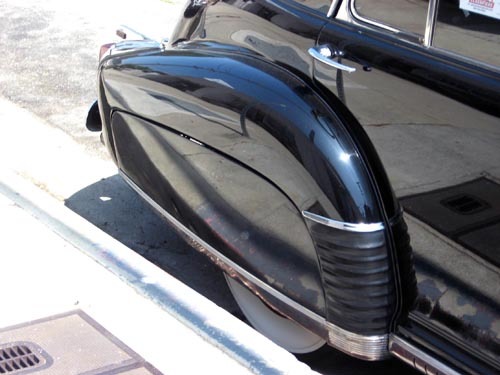 In the thirties and forties, automotive fenders became progressively more streamlined and integrated into the body. By the late fifties, they had almost completely “melted” into the surrounding body. Fender skirts, however, have never quite caught on, perhaps because they complicate tire-changing. Cowl: The portion of the body structure below the base of the windshield to which the front fenders are attached. In a front-engine car, the cowl incorporates the firewall, the panel that separates the engine compartment from the cabin. The cowl usually contains the car’s heating and ventilation system (which on modern cars generally draw their air from a plenum at the base of the windshield). The cowl is a major structural element and is typically the second-largest (and most complex) single piece of the body. Manufacturers will often share the same cowl structure between several vehicles. For example, the 1961–1966 Ford Thunderbird shared its cowl with the contemporary Lincoln Continental. Floorpan: The bottom of a vehicle’s body, generally beginning at the cowl and comprising the floor of the cabin and cargo area. On many mass-production cars, the floorpan is one big, complex steel stamping. Since this is usually the largest and most expensive single piece of the body, it’s common for manufacturers to use the same floorpan (or variations of it that can be made with the same machinery) for several different models. Until the early fifties, many cars had pop-up vents in the cowl, at the base of the windshield. 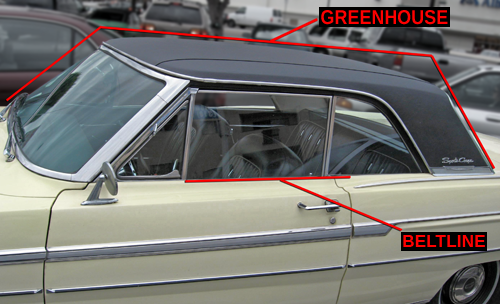 Modern cars still take their ventilation air from this area, although usually through a grille just behind and below the trailing edge of the hood, in the same area as the windshield wipers. Sill: Sometimes called the rocker area, the sill is the outermost longitudinal section of each body side, running beneath the door openings from the trailing edge of the front wheelhouse to the leading edge of the rear wheel opening. The sills are important structural members, particularly in unitized or semi-unitized vehicles, and typically provide a great deal of the body’s total bending stiffness. Early unitized cars, particularly ones intended to offered in convertible form, often had large, complex sill structures. 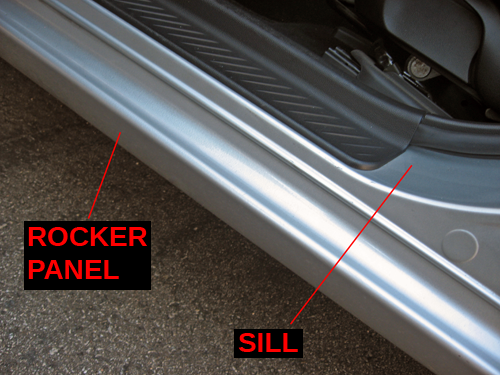 Rocker panel: The outside of the rocker area, which may be either a separate body panel concealing the sill (and/or the frame rail beneath it) or simply the exposed, finished outer section of the sill itself. Some cars cover the rocker panel with a plastic or chrome rocker molding, either for decoration or to protect the rocker panel from stone chips and road salt. 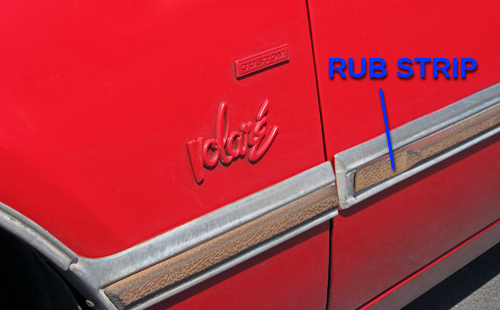 Rub strip: A horizontal trim strip or molding running across the door and sometimes the inside of the front fender to protect against dings and scratches from the doors of other cars. In recent years, it has become popular to omit the rub strips for a cleaner appearance, although the absence of protective trim tends to result in an assortment of minor dings and scratches after a few years in the real world. In the fifties and sixties, there was a great craze for pillarless hardtops, which had no B-posts. Some manufacturers offered hardtop coupes, sedans, and even station wagons. 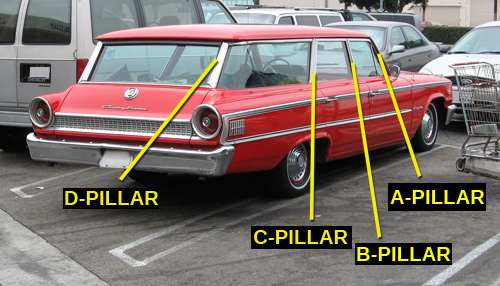 Even if a vehicle has no B-pillars, the pillars behind the cabin are still called C-pillars and D-pillars respectively. 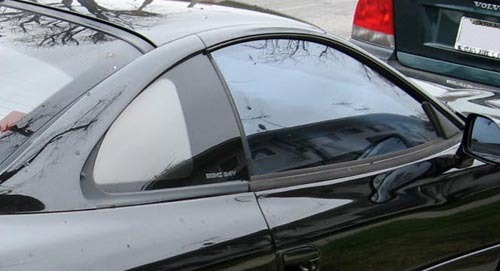 Although true pillarless hardtops are rare today, many cars still strive for a hardtop look by concealing the B-post behind a darkened section of the rear quarter window. This early-nineties Dodge Stealth shows off a typical “blackout pillar” treatment. Note that the front windows have no frames, adding to the effect. Sail panel: The body panel covering the rearmost roof pillar. In the sixties and seventies, there was a brief vogue for “flying buttress” roof designs, in which the sail panels extended further back than the roof pillars themselves. This is still occasionally seen on mid-engine cars, although it has fallen out of favor for most ordinary passenger cars. Rake: Stylists use the term rake (or fast) to describe the angle of the windshield. In the forties and fifties, customizers and hot-rodders also coined the word rake (sometimes California rake) to describe a vehicle whose tail is noticeably higher than its nose. Greenhouse: The collective term for the roof, roof pillars, side windows, windshield, and backlight. Beltline: The uppermost horizontal edge of the doors and body sides, below the greenhouse. Tumblehome: In automotive terms, the angle of the sides of the greenhouse (when viewed from the front or rear) relative to the vertical plane. If the side windows are completely vertical, tumblehome is zero. Beginning around the late 1950s, American stylists became enamored of increasingly radical tumblehome as a way to make a vehicle look lower than it was. However, extreme tumblehome generally requires the use of curved glass for the side windows (which is more expensive than flat glass) and can cut significantly into passengers’ head and shoulder room. 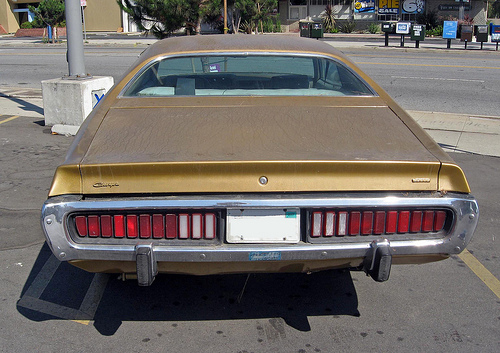 Chrysler’s early-seventies “fuselage styling” theme emphasized some of the industry’s most extreme tumblehome. 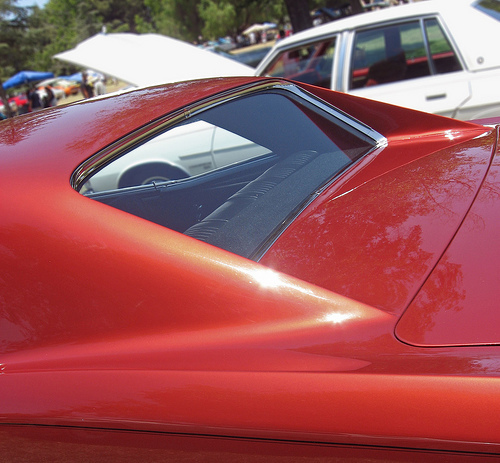 The sides curve inward so sharply that the top edge of the side window sits practically above the driver’s shoulder. Light: Stylists sometimes refer to a car’s windows as “lights.” For example, small windows between the roof pillars and the car’s side windows are sometimes called quarterlights (or quarter windows). The rear window is called the backlight. A car with three windows on each side (for example, two regular windows and a quarter window) is called a “six-light” design, while one with only two windows per side is called a “four-light” design. 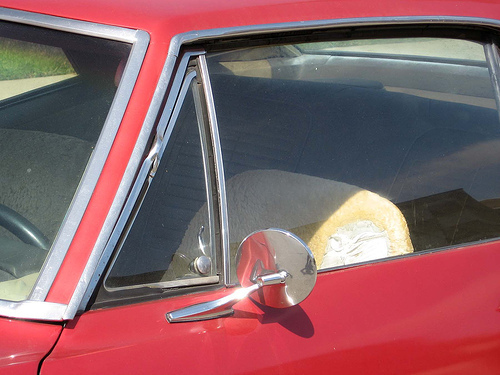 A 1967 Pontiac Firebird shows off its front quarterlight (which GM originally called “ventiplanes”). Note also the prominent chrome reveals around the side window and windshield. Reveal: An exterior molding or decorative trim piece surrounding a window or other exterior body component. Drip rail: A molding U-shaped channel at the outer edges of the roof, above the doors, that channels rain water away from the side windows. Modesty panel: A body panel below the front or rear bumper that hides the ends of the frame or body structure. Airdam: A modesty panel under a car’s front bumper that controls the flow of air under the car. The main purpose of the airdam is to force air to flow around the car rather than under it in the interests of reducing aerodynamic drag and lift. On many modern cars, the airdam also channels air into the radiator, the engine’s air intake, and sometimes the front brakes. Most modern cars have airdams, but few are as aggressive as that of the Mitsubishi Lancer Evo. The extended lip also functions as a spoiler. Scoop: An opening that allows outside air to pass through a body panel. A functional scoop may serve to channel air into the cabin’s ventilation system; the engine’s intake manifold, radiator, or intercooler; or the brakes. Some scoops have more than one plenum, allowing them to perform several of these functions at once, but it’s more common for a scoop to be strictly decorative. Mid-engine cars, like this Lotus Elise, typically have a formidable array of functional scoops to channel cooling and intake air into the engine. Louver: A slot or vent that either admits or exhausts air. Working louvers may provide additional airflow to intercoolers or brakes or allow hot air to leave the cabin or engine compartment. Nonfunctional fender louvers periodically become popular as cosmetic add-ons. 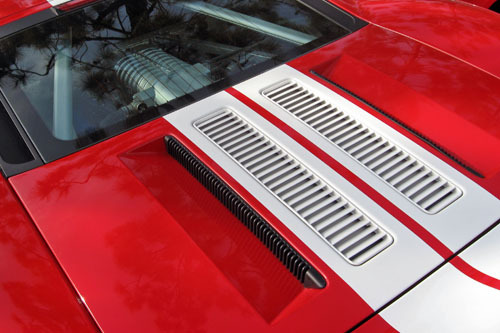 The Ford GT shows off its array of engine cooling louvers. The GT has a great deal of heat to dissipate; under the cover is a 5,409 cc (330 cu. in.) DOHC V-8 with a Lysholm-type supercharger, making 550 horsepower (410 kW). Belly pan: A smooth pan or tray mounted on the underside of the car. Since underbody components like the engine oil pan, frame rails, and exhaust pipes tend to be aerodynamically cluttered, the typical purpose of the belly pan is to reduce drag. (Many modern cars have a detachable plastic cover under the engine, which serves a similar purpose at less cost than a full pan.) On some modern exotic sports cars, the belly pan incorporates venturi to control the speed of air passing under the car, which can be used to provide negative lift (downforce). The slots under the rear bumper of this Ferrari F430 are diffusers for the underbody venturi. Although the F430 has no wings and only a modest lip spoiler under the nose, the underbody channels enable it to produce more than 600 lbs (2,670 N) of downforce at 185 mph (300 km/h). The typeface used in the image labels is Liberation Sans, one of the Liberation Fonts (version 2.00.1 or later), which are copyright © 2012 Red Hat, Inc., used under the SIL Open Font License, Version 1.1. LIBERATION is a trademark of Red Hat, Inc.
Perhaps you can delve into when, why and how the term “marque” came to be widely used. Granted I’m an old fogey, having first acquired my fascination with cars at around age 8 in the mid-1950s, when everyone called them “makes.” I first stumbled upon “marque” when revisiting my childhood interest via online browsing. To be honest, my gut, emotional reaction at first was “Gee, that sounds rather pretentious,” but I soon found that the term was in virtual universal use among car aficionados. It’s still difficult for me to use the term myself! Other than the French origin and meaning of the word, I haven’t come across anything about its adoption as the accepted term. Did I say that I find your site endlessly fascinating, educational and entertaining? Well, I just did. Thanks. I’ve never studied when the term became popular in the U.S. — if I were to guess, I’d say it was the mid-seventies, and I would blame the influence of British journalists like L.J.K. Setright. I CAN tell you the distinction I draw between make and marque. They are often used interchangeably (most DMVs still just say make, last time I checked), but they don’t mean the same thing. “Marque” does not mean “make,” but rather “mark,” as in [i]trademark. [/i] “Make” connotes manufacture, but “marque” refers to a [i]brand[/i], which is a different kettle of fish. Acura and Scion, for example, are marques of Honda and Toyota, respectively. While those brands are the make of record as far as the Department of Motor Vehicles is concerned (woe unto you if you try to register your Honda Integra), they are essentially a marketing fiction. The vehicles share most of their components with other Honda and Toyota models, and are sold as such in some markets. For the modern industry, which have a huge amount of platform-sharing, badge-engineering, and thinly veiled clones sold under different brands (e.g., most of the modern GM lineup), not to mention the confusing circus of acquisition and divestiture, “marque” is usually a far more appropriate term. If we’re being technical, to what make would you assign, say, the Volvo S40, which was engineered during the company’s ownership by Ford, using a platform built by Mazda, with engines shared with the European Ford Focus? (To name but one convoluted example.) Or a brand invented out of whole cloth, like Scion, which is essentially just re-badged and sometimes mildly facelifted versions of Japanese and European-market cars not otherwise sold in the U.S.? That is my reasoning, at any rate. What’s the origin and meaning of that term? A valance (not valence, which means something else) is a skirt or panel intended to conceal edges and/or mechanical bits. It’s not specifically an automotive term; Merriam-Webster’s online dictionary refers to the little demi-curtains that you sometimes see over the tops of regular curtains, hiding the curtain rods. Merriam-Webster says the etymology is an Old French verb, which originally referred to lowering a flag, and more broadly means to hang down. In their book on automotive styling, Michael Lamm and Dave Holls define valance as the part of the fender between the wheel and the door (i.e., behind the front wheel or ahead of the rear wheel). That is one type of valance; another is the skirt under the front or rear bumper, which Lamm and Holls (and the [i]Auto Dictionary[/i]) call a modesty panel. From a linguistic standpoint, I would say a modesty panel is a valance, but not all valances are modesty panels, if that makes sense. Your definition of “wheelbase” fails to mention that it need not be the same on both sides of the car – not if we’re talking French cars at least. I’d like to know the straight dope about the "formal roof." From the contexts I see it in here it denotes a fairly upright angle of the backlight with a square-ish c-pillar, but then I get this on google , which is a far cry from those proportions. To an extent, yes. More broadly, "formal" means simply that it evokes the feeling of a limousine. That typically means relatively upright C-pillars, "blind" rear quarter panels, and a relatively small backlight — which on limousines are intended to provide space and privacy for back-seat passengers. The 1961 Imperial LeBaron in a recent article is a good example, as is the old Thunderbird Landau of the mid-sixties. By contrast, something like GM’s ’59-’62 four-window C-bodies would [i]not[/i] be considered formal, even though the roofline is pretty square. In the link you mention, what they’re referring to is the padded vinyl top. Leather or vinyl roof coverings have been a common limousine styling feature at least since the thirties, often complete with fake landau irons. Customizers in the late forties and early fifties went through a brief vogue for Carson padded tops, which blanked off part of the backlight and sometimes the rear quarter windows. The padded top really took off in the late sixties, and became ubiquitous in the seventies, thanks in large part to the Lincoln Continental Mark III, which revealed a lucrative market for styling cues borrowed from prewar luxury cars. American automakers finally stopped offering padded tops in the early nineties, and upright rear windows became passe — mostly because they’re aerodynamically disastrous — but there are still some people who associate the padded vinyl top with limos or old-school luxury cars. You see aftermarket tops on some really odd cars from time to time, typically accompanied by tacky dealer-installed gold packages. Is there a name or term for the flat space under the rear window? The older cars had a great area to lay items on, hats, toys….great space foe the cat to sleep….we seem to recall it had an actual name. That space is usually called a package shelf. I know what tumble home/tumblehome is, but what is the term, reversed essentially, for the body curve as it meets the chassis. I want to call it “tuck under” but can’t reference it anywhere. IT was as extreme as the tumble home in most cars of the early 70s. The term I’ve heard for that is turnunder. In Australia, quarterlights are usually referred to as [b]quarterpanes[/b], as in panes of glass. What is the term for the lip above the wheel wells? The 1995–2005 Chevrolet Cavalier doesn’t have them, neither does the Ford GT pictured in this article. For a long time they mostly flared out like on your ’63 Ford wagon and ’69 Grand Prix, but some flared in like on the ’69 Plymouth Barracuda hardtop. 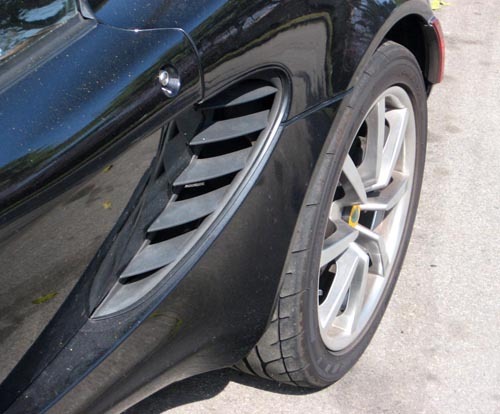 In most modern cars, like the Lotus Elise, it’s a uniform flattened ring. I think I’ve heard people use something like (but not) canard to refer to it. GM and Ford call that the lip molding, which is straightforward enough. With certain designs (e.g., the Mercedes 190SL), I could see why someone might dub them canards, although in aircraft terms, a canard would be a primarily horizontal surface, since in that case, it functions as an airfoil. I wish you’d add a Facebook link so I could share this article with my friends. Its a great way to increase visitors to your site. I experimented with some of the ‘share’ buttons, but a lot of them tend to be surprisingly resource-hungry (none of us want to make the site run slower!) and I know some users are not keen on the data mining those things tend to entail. (Social media sites often use those buttons to gather information on people’s behavior outside of the social media site itself.) You can certainly feel free to share links to the articles on whatever social media site you wish via the old-fashioned cut-and-paste-the-URL method, though. 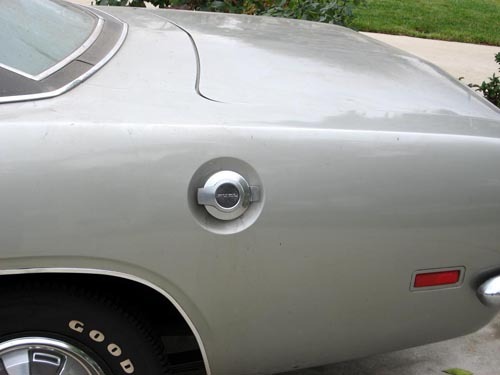 On the ’71 Maverick, What is the body panel called that the gas cap is on? fantastic info and a good read, keep up the good work mate. why quarter glass is fitted in cars? What you refer to as fender skirts we in New Zealand knew as spats, presumably from British use of those protective leggings worn in an earlier era. Some American cars of the 1950s such as Chev had them, and British cars with US styling such as Vauxhalls. Most got left off and lost. Also the low wheel arches sometimes made wheel changing difficult if the bodwork was not raised relative to the axle. This is why Chevs And others had a bumper jack. When it broke a bottle jack under the back axle would NOT do! That’s styling for you. I have a ford fiesta gio 94 that I need to replace the side panel above the front drivers side tyre. I believe this panel is called a quarter panel? This panel is also attached to the front bumper. I just wanted to clarify if I have this name correct and how much I would be looking at paying for the replacement of this panel. The outer panel there, assuming I’m correctly grasping your meaning, is typically called the front fender in the U.S., the front wing in British usage. I’m afraid I can’t help with parts or repairs; I couldn’t help estimating costs even in the States, and if you’re in the U.K. or elsewhere, I definitely wouldn’t know! What you call the “package shelf” is more commonly called the “parcel shelf” in the UK, meaning the flat area between the back of the rear seat and rear window. It could also refer to a shelf across the front of the car as in the early BMC Mini’s, Morris Minors and Austin 1100’s and its badged clones. Mini’s also had parcel bins in each door and either side of the rear seat. with careful packing you could get as much stuff in them as the admittedly tiny boot, or trunk to you. Years ago I had a mk6 Lincoln with a separate small window incorporated in the C pillar, with their own independently operated lamps. I always referred to them as opera ligths, is there another (if any) term for them?. In the U.S., the glass is typically called an opera window and the associated lamps “coach lights” or “coach lamps” — the latter is what the Lincoln Continental Mark VI brochure calls them. Help me remember please…..what is the distance between the front wheel arch and the door called? In classic cars, a longer dimension is desired for prestige, as it usually indicates a big powerful engine with a long classic hood.